Three women are in an art gallery, looking at dubious concoctions on the walls and questioning their meaning, when the Marshalls spokeswoman whisks them out of there and into an environment that one supposes is meant to represent the shopping experience you'll find at an actual Marshalls (only they left out the piles and piles of useless junk crammed high in aisles you can barely fit through and the poorly trained and grumpy staff). One of the three women picks up a purse in this fantasy version of the store and says, "This is art." The Marshall's spokeswoman agrees, noting "Yeah, who needs 'real' art. Such a snooze." We have always been at war with Eurasia. 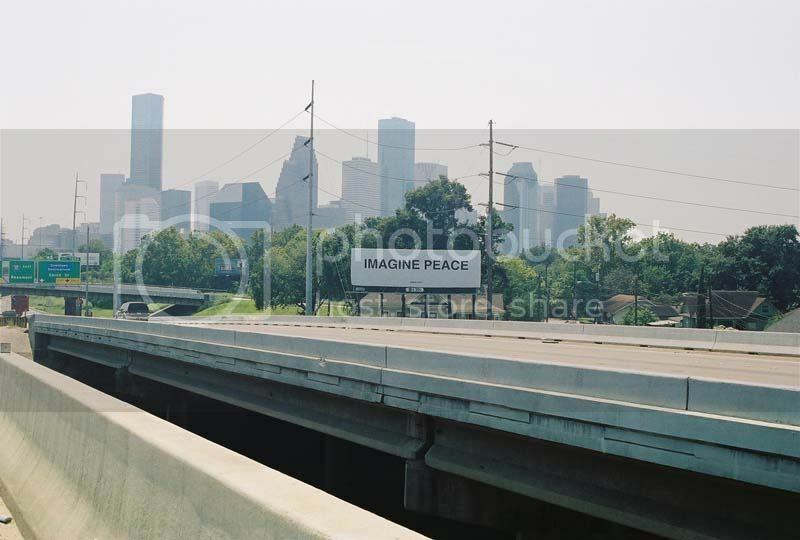 If you've driven south to downtown on I-45 recently, you've seen this billboard by Yoko Ono. 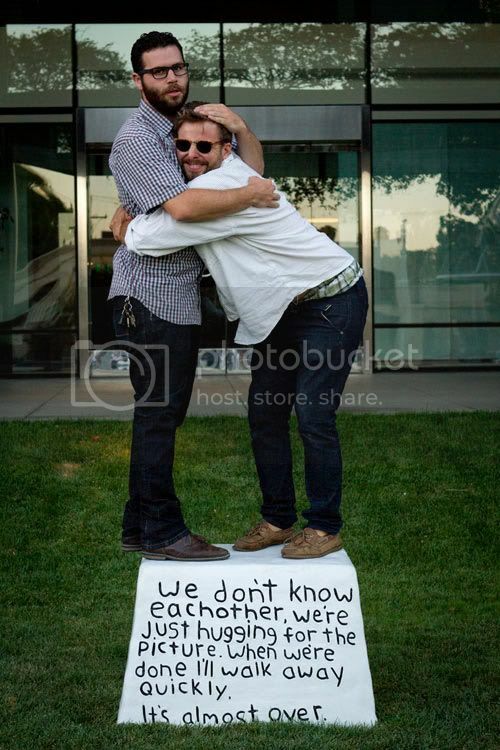 Apparently it was sponsored by Colton & Farb for the 10th anniversary of its initial erection in New York after the September 11 attacks. In some ways, it is more provocative now--after all, we have been continuously at war for 10 years. There are millions of American children growing up who have never experienced their country at peace. Still, the press release manages to amuse: "Deceptively simple with its basic black and white palette the billboard engages the thoughts of the viewer on an almost subliminal level, inevitably provoking discussion of current events." Hmm... I don't think its simplicity is "deceptive", and stark black type on an enormous billboard is hardly subliminal. But hey, it's a good thing to do, even if it is as likely to have as much impact on America's wars as a large pancake dropped from a height of 10 feet (to paraphrase Kurt Vonnegut). Something Rotten in Riverdale. Bob Montana, in addition to sporting a killer beatnik look and having an awesome name, created Archie Andrews, the famously wholesome teenage comic book character. He drew Archie for MLJ Comics until his death in 1975. It was "work for hire" (even though he created the character), but at least he got to keep all his original artwork, which wasn't the norm back then. Later his heirs made a deal to sell his original artwork to comic book distribution king Steve Geppi. Montana's family hired hired Jerry Weist to appraise the collection. Weist thought it was worth $2 million, and Geppi bought it for $1 million, to be paid in four quarterly installments. He paid the first two but then claimed that he was out of money (his businesses were suffering serious reverses). This purchase was an investment for Geppi--he planned to sell the Montana pages off piecemeal. Unfortunately, the individual pages sold for much less than Weist's estimate. Weist, who recently died, might have been basing his valuation on previous auction results. If so, one can speculate that the appearance of so many Bob Montana pages on the market (or even the knowledge that they would eventually be on the market) depressed the prices. Geppi offered to return the unsold pages and let the Montanas keep the $500,000. They sued Geppi for damages, saying he had misrepresented his ability to buy the pages. The suit is ongoing (as far as I know). There don't seem to be any obvious bad guys here. The story about how an art deal can go bad, though, is fascinating. Daniel Best has written an exhaustive account of it on his blog, 20th Century Danny Boy.